Sometimes it’s hard to let go of the summer: warm mornings, holidays, swimming in the sea, Pimms, long lunches – and Pavlova. 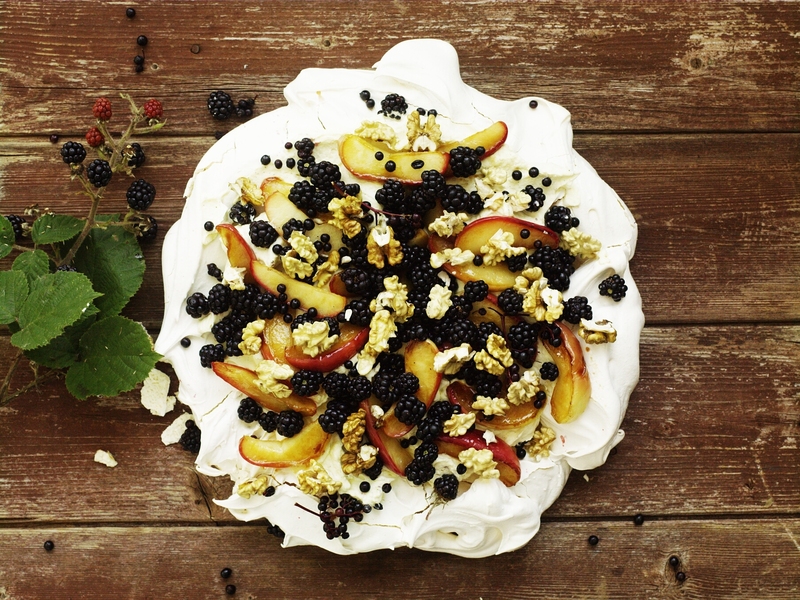 This Pavlova, though, is inspired by the autumn hedgerow, bursting with ripe elderberries, tart blackberries and sugary, fried windfall apples. Wet walnuts, found in markets and farm shops during the autumn period, are fresh, sweet and milky. Heat the oven to 120°C/235°F/gas mark 1. First, make the meringue. Place the egg whites in a large, clean bowl. Whisk with a hand-held electric whisk until they form and hold soft peaks. (You can do this in a food mixer with a whisk attachment, if you prefer.) Keeping the whisk running, add 1 large spoonful of sugar at a time, until all the sugar is incorporated. Continue to whisk for a further 6–8 minutes, until the meringue is thick, pale, smooth and glossy. Heat the oil in a non-stick pan over a medium heat, then add the apple. If the apples are a little tart, add the caster sugar and stir. Cook the apples for 4–5 minutes, turning them over occasionally, until they have taken on a little colour and are beginning to soften. Remove the pan from the heat and allow to cool. In a clean bowl, whisk the double cream with the vanilla seeds until thick and pillowy. Spoon the cream over the meringue base spreading it roughly out towards the edges. Arrange the cooked apple pieces over the cream. Scatter the blackberries over the top. Finally, sprinkle over the broken-up wet walnuts (or walnuts or hazelnuts) and the elderberries, and serve.